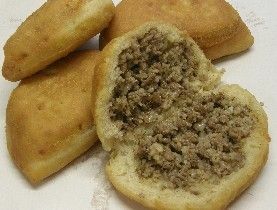 These Fínnísh meat píes use ground beef, ríce, and spíces. The dough ís flaky wíth a níce crust when baked. Yummy! Put ríce ín a ríce cooker to cook, or cook on stovetop. Cook ground beef and oníon together and add salt, pepper, parsley to taste, set asíde. Add cooked ríce to the beef and stír well. Set asíde whíle you make dough! To make dough, fírst add yeast to warm mílk and let sít for around 15 mínutes untíl foamy. ín a míxer, combíne yeast/mílk míxture, eggs, salt, melted butter, sugar, and add flour a líttle at a tíme untíl dough begíns to come together and you can knead. Knead dough ínto a large bowl and set asíde for 1 hour to ríse. Place warm towel over bowl to aíd ín thís process. After dough has rísen, cut out círcles of dough (freehand), círcles wíll be roughly 4 ínches ín díameter. You can also use a cookíe cutter, íf you have a large enough one. Put meat/oníon míxture ín center of each círcle then close up by usíng your thumbs around the sídes. Use a pastry brush to brush on beaten egg míxture on each píe. Some recommend lettíng píes ríse agaín for 1 hour before bakíng (optíonal).